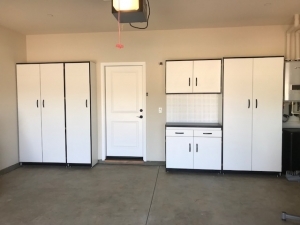 Garage Cabinets - Alpine Cabinet Company "
We make garage cabinets that are so strong, well-built, versatile and attractive that they not only bring storage and organization to your garage, they raise the value of your home! Our cabinet features include: Exclusive Shelf Hanger System with Center Supports, Hardwood Foundation and Integrated Steel Leg-levelers. Our workbenches are the REAL thing, with a ruggedly constructed hardwood top frame and laminated high pressure Formica tops with a strong reinforced trim. The steel shelf hangers easily slide into the cabinet side walls and the shelves themselves are easily fitted over the hangers. Once installed, the shelves cannot slide forward off the hangers, and the hangers cannot fall out or tear out. Our adjustable shelf system has been tested to 500 lbs. Push pin shelf hangers were never designed for heavy duty applications. For this reason, you will not find them in our cabinets. 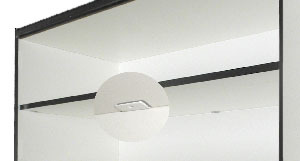 To eliminate shelf sag, all wide-span adjustable shelves are center supported by our patented hangers. This exclusive feature is made possible by our 1/2” thick back panels and a hanger that cannot fall out. 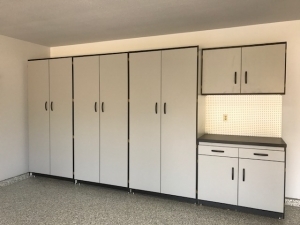 Most garage cabinets are essentially a simple box design, mounted to the wall. The wall to which the box is mounted must provide the rigidity for the cabinet as well as sustaining the full weight of the cabinet and its contents. By contrast, our floor standing garage cabinets are built upon a rigid hardwood foundation. This foundation gives our cabinets the strength to stand alone while also providing an attractive recessed toe kick. All four leg levelers are completely adjustable from inside the cabinet. The leveler shank is 3/8” x 3” diameter solid steel and the entire system is integrated into the hardwood components of the foundation assembly. The hardwood deck provides a solid foundation for the leg levelers, which are completely adjustable from inside the cabinet. 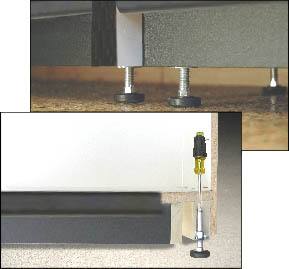 The leveler shank is 3/8” x 3” diameter solid steel and the entire system is integrated into the hardwood components of the foundation assembly. Our workbench cabinets feature the same heavy duty foundation found on all of our floor standing garage cabinets, as well as a ruggedly constructed hardwood top frame. 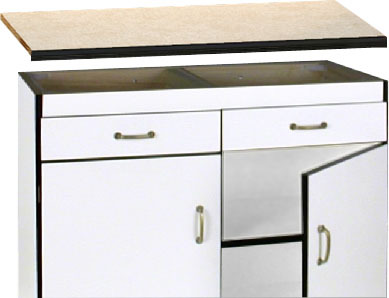 The bench tops are laminated with high pressure Formica and include a strong reinforced trim. While the bench is beautiful to look at, it is also quite capable of holding hundreds of pounds. Many competitors cut costs on workbenches by using cabinets originally designed as wall units, and covering them with a light duty work surface.